New technology is changing nurses’ daily work, with many welcome devices freeing up time for patient care. Northern Lincolnshire and Goole Hospitals NHS Foundation Trust lead nurse for medicines management Karen Roe says she is suddenly ‘very popular’ after introducing a new key system. 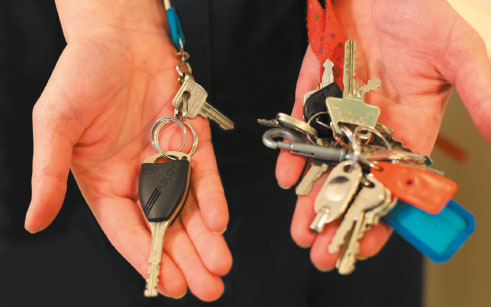 The PROTEC2 CLIQ electro-mechanical locking system, made by security experts Abloy UK, means every nurse on the ward, including bank staff, now has an individually programmed key to access drug cabinets, fridges and cupboards. The system allows her, as main administrator, to permit access to drug cabinets centrally and delete access completely if a key is lost or falls into the wrong hands. ‘Nurses can care for their named patients without having to wait for a colleague to finish the drug round in her bay. Drugs can be given on time and at intermittent times, rather than at one big drug round,’ she says. Meanwhile, nurses at seven Yorkshire trusts have been using a new IT system since December 2014 that allows them to access test results from other participating trusts and GP surgeries without the need for follow-up phone calls. Helen Jessop is a nurse specialist and bone marrow transplant co-ordinator at the Royal Hallamshire Hospital, part of Sheffield Teaching Hospitals NHS Foundation Trust. She says the ICE Open Net system saves the haematology department several hours a week. The prompt receipt of blood or urine test results for myeloma patients awaiting a transplant means that the patient gets the treatment sooner. At University Hospitals of Morecambe Bay NHS Foundation Trust, a new system of handheld devices was launched last month to complement the new white screens that have replaced felt tips on white boards. A £1.2 million award from the Department of Health paid for 25 new white screens in wards across the trust, where all smart card holders can access information about patients on the ward. ‘For example, if a patient requires discharge medication, we can indicate that a discharge script is required,’ explains the trust’s deputy chief nurse Joann Morse. By the end of this month 950 handheld devices were carried by nurses to record observations at the bedside. These link to the trust’s electronic patient record and any early warning triggers will appear on the white screen. ‘It’s the first step,’ says Ms Morse.